This full moon is not only the closest and largest full moon of the year. It also presents the moon’s closest encounter with Earth for all of 2015. The moon will not be so close again until the full moon of November 14, 2016. In other words, it’s not just a supermoon. It’s the closest supermoon of 2015. This total lunar eclipse will be visible from most of North America, South America, Europe, west Asia and parts of Africa will be able to see the eclipse. In the Americas, the eclipse will begin on the evening of September 27, 2015. The eclipse will last for 3 hrs and 20 mins from beginning to end. The Moon will be totally eclipsed (totality) for about 1 hr and 12 mins. 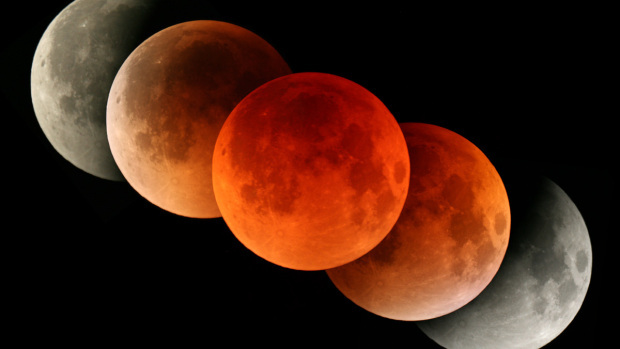 This eclipse is the fourth and last in a tetrad, a series of four consecutive total lunar eclipses in 2014 – 2015. The term Blood Moon has recently become popular when referring to the total lunar eclipses in the 2014 – 2015 lunar tetrad. While the term has no technical or astronomical basis, many people believe that it comes from the Bible, and that the occurrence of the lunar tetrad is a fulfillment of a biblical prophecy.